Since the launch of the EW-Compass last year, we've received many e-mails from you telling us how it has helped in your trading and making those all-important investment decisions – it's fantastic news for us because that is exactly what it's designed to do. 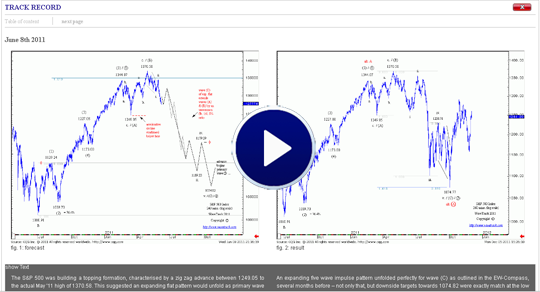 One of the other insights we've gleaned from your e-mails is the way in which the use of Fibonacci price-ratios overlaid to each pattern forming a connecting 'matrix' of price convergences enhances your understanding of how ongoing price activity unfolds – into harmonic and symmetrical equilibrium that attracts the price to certain 'sensitive' levels that await the completion of the patterns that R.N.Elliott himself categorised back in 1938. It has taken nearly twenty years, but we've created a systematic approach in using these fib-price-ratios – each pattern characteristically 'vibrates' to different ones, and knowing what they are significantly reduces the subjective 'guessing-game' that is commonly found in mainstream EW-analysis. If you know what I mean by this, then it is because you have probably experienced the effects of attempting to trade or invest solely on the 'arbitrary' application of wave labelling or the 'psychology' effect portrayed as the 'causation' to Elliott Wave price activity. Too often is wave labelling applied to price data in a totally subjective fashion without regard to the pattern itself – and contrary to common belief, psychology is not a 'causation' that drives the ebbs and flows of market price activity, but is simply another 'effect'. To trade or invest successfully, it's imperative to learn the true causation laws that govern the formation of Elliott Waves. Elliott wrote his final monograph on this discovery in 'Nature's Law – The Secret of the Universe' (1946) and in it, wrote introductory chapters entitled 'Rhythm in Nature', 'Nature's Law' and more importantly, in chapter 4 writes "All human activities have three distinctive features. Pattern, Time and Ratio, all of which observe the Fibonacci Summation Series". It does not stretch the imagination too far for us to realise that in his final years, Elliott was encouraging us, guiding us, to explore the true but ancient source of his new methodology. The book references R.N.Elliott listed at the end of 'Nature's Law' clearly lit the way forward for us to follow – names and titles such as Pythagoras, Fibonacci and Dynamic Symmetry, the Law of Phyllotaxis, Nature's Harmonic Unity and Proportional Form are just some of the subjects he points us towards to further our understanding of price behaviour. If you're intrigued by this just as much as I was over twenty-five years ago, then join us in this ongoing journey of discovery. It's not enough to look at track records all the time, an Elliott Wave forecast has to be applied but then most of all 'experienced' before it can be absorbed as knowledge - and I can't think of a better way of helping that process along than ensuring the EW-Compass report meets those very high standards that we set ourselves in the pursuit of progress. 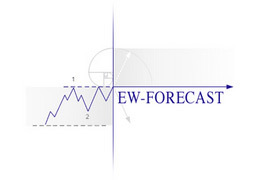 The EW-Compass report is unique to the methodologies of the Elliott Wave Principle because it incorporates our proprietary analysis of Geometric Ratio & Proportion that is the result of over 25 years of in-depth research into the laws of price measurement and amplitude – how far a particular trend will travel before it changes direction. Testimonial - "I just wanted to congratulate you on the EW-Compass reports launch. I'd say all the work you've all put into this project is well worth it…never cease to be amazed by the harmony that you find between the fib relations you highlight and the Elliott count you propose. You are a true descendant of RNE, and I'm quite sure he'd have really loved to see your work…Another aspect that sets you apart is your deep knowledge of the how and why of pattern relationships between higher & lower degrees of the same price action. So much to learn there". – T.S. Not only that but the EW-Compass assembles up to twenty charts in each issue twice a week incorporating all four asset classes, stock indices, currencies, interest rates and commodities that trade right across the world to give you a precise and complete picture of developing trends without the added expense of multiple subscriptions. Testimonial - "…I've always admired your work. As soon as I saw that you published it on a website, I had to sign up. Allow me to applaud your choice of pricing as well. Very reasonable, at that price you should be able to gain hundreds, if not thousands of subscribers". – D.L. The EW-Compass is not only your guide to the future of price development, but it is also extremely educative. Each report explains the 'logic' of each forecast in plain language in describing each pattern that is forming and illustrating it to completion. And just as important, each chart describes how price targets are measured using the specific Fibonacci guidelines that apply to each pattern, whether these are expanding or diagonal five wave impulses or something much simpler like the zig zag. Testimonial - "…first let me say how much I'm learning from your publication and how it's changing my views on counting! …your work is extraordinary to behold". – C.M. But don't just take our word for it – take a look at some of the actual forecasts that were published during the last nine moments – and compare the results! – WARNING! These forecasts are so accurate that you may want to question why you have been subscribing to anything else during the last years! – please read our Risk Disclaimer at the bottom of this page. The S&P 500 was building a topping formation, characterised by a zig zag advance between 1249.05 to the actual May '11 high of 1370.58. This suggested an expanding flat pattern would unfold as primary wave 2, a counter-trend decline that would form a low into the annualised cycle low of October. This was no ordinary expanding flat because intermediate wave (C) was expected to decline beyond common fib. 38.2% measurement guidelines – the reason – a comparative study of other global indices and their price target levels suggested an elongated (C) wave would unfold – applying two fib-price-ratio measurements projected a low to 1074.82. An expanding five wave impulse pattern unfolded perfectly for wave (C) as outlined in the EW-Compass, several months before – not only that, but downside targets towards 1074.82 were exactly match at the low of 1074.77! – the low also coincided with the annualised October cycle period! A massive directional reversal occurred afterwards with trading up to 1292.66 – a massive +20.27% rise. We had been monitoring the progress of the Hang Seng for some time and identified an unfolding expanding flat pattern that began from the Nov.'09 high of 23099.57. Composed of three price swings labelled in minute degree, a-b-c, wave c to the downside remained incomplete. Basis fib-price-ratio measurements, we could expect to see a massive sell-off for completion towards 18110.22. This was another factor that contributed to the S&P forecast for declines to 1074.82 (see previous track-record example – above). As the weeks passed, the Hang Seng then began to accelerate lower, a characteristic of the expanding-impulse pattern that was expected to unfold as minute wave c of the expanding flat. A low finalised the decline with a 1 day 'exhaustion' to 16170.35, trading slightly below our idealised target level but next day, snapping higher never to see those levels again! The October advance resumed the larger uptrend but this initial sequence had already completed an expanding five wave impulse pattern at 1292.66 and was already engaged in a counter-trend decline. Hot debate continued as mainstream analysis was forecasting a collapse below the October lows. In contrast, the EW-Compass report has identified European stock indices unfolding higher in five waves ensuring the decline was simply a three wave zig zag correction – the S&P downside forecast measured a maximum low to 1156.33 but then staging a reversal signature that would confirm the next upswing would resume the larger trend. Wow! Despite headline bearish news dominating the market, the S&P traded down to a low of 1158.66 then turned skywards! This reversal was just a couple of points away from the measured target at 1156.33 but it was even more accurate for other indices that were included in the report at the same time. The Euro/US$ had just completed upside targets as intermediate wave (A) that unfolded from 1.2859 ending at 1.4944. 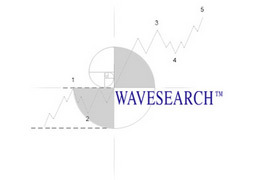 A counter-trend decline had begun as wave (B) that was described as unfolding into a single zig zag pattern, a-b-c. The initial sell-off to 1.4048 ended minor wave a. and so wave b. was then forecast to begin a counter-trend rally to 1.4727, the fib. 76.4% resistance before resuming a decline to begin wave c. Downside targets for wave c. were measured to 1.3521 by extending wave a. by a fib. 61.8% ratio. Minor wave b. rallies did unfold as forecast, ending at 1.4698 marking the price extremity of a running flat pattern – just 29 pips from measured levels! The following decline as minor wave c. eventually unfolded into the early Oct.'11 low at 1.3497, just 24 pips from idealised target levels before it staged a reversal signature that resulted in a subsequent advance that traded to 1.4248 – a massive reversal swing of 751 pips! Crude Oil was in the process of completing an expanding five wave impulse pattern in its advance from the May '10 low of 67.15. Upside targets had just been achieved at 114.83 and so the EW-Compass report had then forecast a multi-month decline to begin. The depth of the decline would be dependent on the amplitude of the initial sell-off – this had not yet begun when this update was published, but as the weeks ticked by, downside targets were updated towards 83.97 (July 21st) and later 75.71 (August 11th). The decline from 114.83 was described as unfolding into a zig zag pattern and these unfolded to exact measurements into the Aug.'11 low at 75.71. The net decline from top to bottom was a huge US$39.12 dollars, a -34% depreciation! The following upswing traded to 90.69, a massive rally of almost US$15.00 per barrel before settling back to retest those lows. Silver had been updated to show it unfolding into an expanding five wave impulse pattern from the 14.63 low of February '10. This was labelled in minor degree, i.-ii.-iii.-iv.-v. as intermediate wave (3) within the larger uptrend that remains in progress. Its completion was measured using established fib-price-ratio guidelines towards a high of 50.05, where waves i.-iii. were extended by a fib. 61.8% ratio. The actual high was recorded at 49.91. We warned our subscribers of an imminent decline but was reducing risk by waiting for a reversal signature. That happened just a couple of days later. The decline was forecast as intermediate wave (4) with downside targets to the fib. 50% retracement level of 27.09. This defined support at 'fourth wave of preceding degree' (see Elliott's guidelines). An initial decline to begin wave (4) proved rapid, with an interim low forming to 32.30. This was very instructive for two reasons – first, it confirmed the continuation as a single zig zag but it also confirmed ultimate downside targets to 27.09. This was verified by extending the initial decline between 49.91 to 32.30 by a fib. 61.8% ratio that measured a low to maximise at 24.68. The rest is history – the final low traded in-between, ending at 26.02 before staging a reversal signature and pulling prices much higher afterwards. These track-record examples were just a few selected out of many more shorter-term forecasts that unfolded during the last nine months. 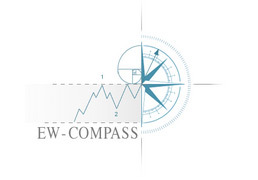 And so whether you are searching for precise Elliott Wave price forecasts to guide your investment decisions or are alternatively seeking tutorial education, look no further than the EW-Compass report. Testimonial - "…I think Compass is an excellent service so thank you. I originally just signed up for 1 month to take a look and, having done that, would like to keep the service beyond that". "Thanks for adding Crude Oil - I caught last week's collapse...I am a very happy client" . – M.P. To begin your FREE WEEK access to the EW-Compass report – just click here and sign in using your existing registration username and password that was sent to you when you originally visited us last. Forgotten your password? – visit www.wavetrack.com and select 'Forgot password' at the top of the home page. Once you have logged in, open the EW-Compass software by selecting the 'EW-Compass' menu top-left of the home page, and in the pop-up menu, select 'Open EW-Compass'. A new window will open, then follow the directions to view all the latest forecasts, or download the .pdf report. The FREE WEEK last 7 days and so you will receive two complimentary updates during this period, but you are also given access to all the archived reports, so take advantage of our offer and download these too. Testimonial - "…The EW Compass is fantastic, congratulations its really good work (best Elliott Wave service I have ever seen)!...I had a few counts in mind before reading your reports, now I have some additional counts which I find very interesting & possible". – P.P. And if you believe we can act as you guide for the future, don't forget that the EW-Compass report is just US$32.00 per month! – Subscribe now and prepare yourself for some fascinating price trends for the coming year! BONUS! – we have upload our annual forecasts for 2012 – Peter Goodburn has created a fantastic video that talks through all the markets in his distinct style. Peter describes each Elliott Wave pattern in progress, the logic of building the pattern, how Fibonacci price ratios highlight important price reversal levels to watch for in the future, and the relative cycles that project major trends for the next several years this is a "not to be missed" opportunity! The information contained in this website (the "Site") has been issued by us. We offer financial information services only. This means that we do not advise our customers on the merits or the suitability of any transactions. In particular, we must stress that the information provided herein is not intended to be specific advice as to whether you should engage in a particular trading strategy or buy, sell, or hold any financial product. We and our related publications apply R.N. Elliott's "The Wave Principle" to historical market price activity which categorizes and interprets the progress of future price patterns according to this methodology. Whilst it may be reasonable to deduce a course of action regarding investments as a result of such application, at no time or on any occasion will specific securities, futures, options or commodities of any kind be recommended for purchase or sale. Publications containing forecasts are therefore intended for information purposes only. Any opinion contained in these reports is only a statement of our views and is based on information we believe to be reliable, but no guarantee is given as to its accuracy or completeness. Markets are volatile and therefore subject to rapid and unexpected price changes. Any person, firm or company relying on information contained in these reports does so at her or his own risk. We give no guarantee as to the completeness or accuracy of the information or of any opinions expressed in our reports. We do not accept liability for any direct or consequential losses arising from any information on the Site, always provided that we, our legal representative or our auxiliary persons did not act wilfully or with gross negligence. In cases of simple negligence we are liable only if we, our legal representatives or our auxiliary persons violate a fundamental obligation under the service agreement. Please do not regard the information or any opinion expressed in this Site as an offer or as a solicitation for an offer by us or any of our affiliates to buy, sell or otherwise deal in any particular investment. The information on this Site is provided solely to enable investors to make their own investment decisions. The information provided does not constitute personal investment recommendations. WaveTrack International GmbH is regulated by the German Regulatory Authority, Bafin - Bundesanstalt für Finanzdienstleistungsaufsicht.